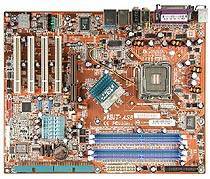 The AS8 is ABIT 's version of the Intel 865PE chipset platform. With SATA RAID, Dual DDR400, AGP 8X/4X, IEEE1394, LAN and µGuru technology, this board is the performer of the year. Using the groundbreaking Hyper-Threading Technology and gushing the extra capacity and peripherals support as well as first class onboard sound, this board can easily be your foundation for a superb system.